Since the nineties, Doug Aitken surprises his public with his interactive installations, playing with the environment around. After winning several awards, such as the international price of the Biennale di Venezia, he presented the “mirage house”, a project that is turning around the world from the Palm Spring desert to the bank of Detroit. This construction is inspired by a typical American suburbian house but it is entirely covered by mirrors that reflect the surrounding environment creating a camouflage effect. The little house then looks like a mirage, an optical illusion, a blurring vision. 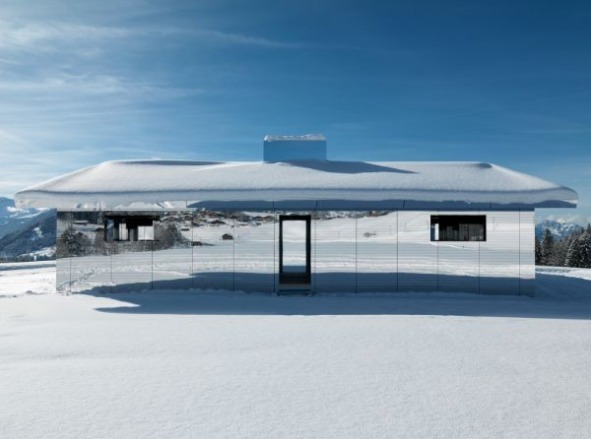 The house is now visible on the top of a mountain in Gstaad, at the occasion of the Elevation 1049 festival. During two years it will remain here, open to the public.